Delabole Building Stone...has been used by Cornish builders for well over a thousand years. Universally acknowledged for its outstanding strength and durability, our naturally attractive building stone will add character and distinction to any building, big or small. The subtle natural colours complement any architectural style. Blue/Grey Sawn Faced... Light Blue/Grey in colour and sawn on both faces to a standard bed size of 100mm (4"). Other bed sizes can be made to order. Blue/Grey Quarry Faced... Predominantly Dark Blue/Grey in colour, with attractive natural variations from sparkly quartz to autumnal brown tinges. "Quarry Faced" is made by sawing the natural joint faces from stone extracted deep down in the quarry. It has a natural face, just as it comes from the quarry, with a sawn back and bed size as above. Rustic... Predominantly autumnal shades of brown in colour with attractive natural variations from sparkly quartz to dark blue/grey. Rustic is made from the natural joint faces that have been stained over the centuries by other elements and minerals such as Iron and Manganese. It has a natural face, just as it comes from the quarry, with a sawn back and bed size as above. The geological formation of this unique building material created pronounced primary and secondary cleavage planes. This allows for easy trimming and shaping of stones on-site using a hammer & bolster to "split" or "crop" to face height or length as required. Alternatively, the stone can easily be trimmed using a small portable diamond saw. The ease of shaping makes our wall-stone extremely versatile and the applications endless, limited only by the designer’s imagination. To ensure our building stone is strong & durable, we use blocks extracted from deep down in the Delabole Slate Quarry, over 150 feet below the earth's surface. 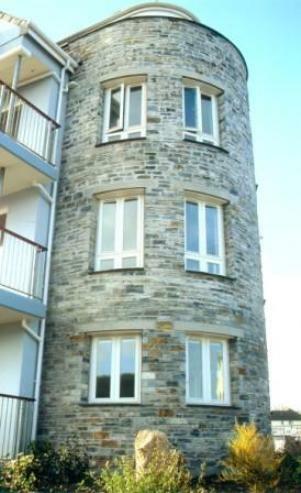 Walls built with Delabole Building Stone are virtually maintenance free. Just wash down occasionally if required. Delabole Slate. Superior handcrafted Cornish slate products direct from the world renowned Delabole Slate Quarry in Cornwall.